On April 28, music executive Jerry Bradley will sit down with museum Senior Historian John Rumble for an interview at 1:30 p.m. in the museum's Ford Theater. Bradley, son of Country Music Hall of Fame member Owen Bradley, learned record engineering and production from his father before working at RCA Records with Chet Atkins. First Atkins' assistant then his successor, Bradley headed RCA Nashville from 1973–82. He signed Alabama and Ronnie Milsap, among others, and contributed greatly to the creation of country music's 'Outlaw' movement. Bradley will discuss his career and the influence Atkins had on it. On May 5, Guitar Man: A Tribute to Jerry Reed, a concert celebrating the music of Chet Atkins' friend and collaborator, will begin at 1:30 p.m. in the museum's Ford Theater. Jerry Reed was known for his innovative fingerstyle guitar playing; his catalog of boisterous country hits including “When You're Hot, You're Hot” and “She Got the Goldmine (I Got the Shaft)”; and his good-humored film roles (Smokey and the Bandit). 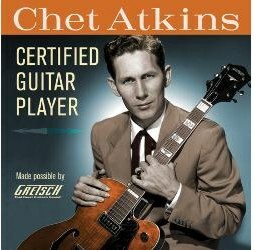 Chet Atkins helped shepherd Reed's career at RCA, recorded dozens of his musical compositions and gave him the coveted honorary designation certified guitar player (c.g.p.). Thom Bresh, Craig Dobbins, John Knowles c.g.p., Brent Mason, Richard Smith, Mark Thornton, Darrell Toney and Sean Weaver, backed by a house band of Steve Bryant, Ric McClure and Matt Raum, will perform their favorite Reed tunes. Both programs, offered as part of the special exhibition Chet Atkins: Certified Guitar Player, made possible through the generous support of the Gretsch Company with additional support provided by Great American Country Television Network, are included with museum admission and free to museum members. The Ford Theater offers limited seating. Museum ticket or membership does not guarantee entry to museum programs. Both programs will also be streamed live at www.countrymusichalloffame.org. All programs are included with museum admission and free to museum members, except as noted below. Sunday, April 29 - 1:00 p.m.
Guitarist Pat Kirtley blends the musical heritage of Merle Travis and Chet Atkins with an eclectic and contemporary repertoire, in genres from bluegrass to Brazilian. Kirtley has won the title of U.S. National Fingerstyle Champion, and in 2006 he was inducted into the National Thumbpicking Hall of Fame. Sunday, April 29 - 2:00 p.m.
Saturday, May 12 - 1:00 p.m. Learn to play guitar like Chet Atkins and Merle Travis. This hands-on workshop will teach the basics of thumbpick guitar. Led by versatile guitar player Sean Weaver, recipient of awards from Home of the Legends Thumbpickers Contest and the Jimi Hendrix Electric Guitar Competition. Guitars provided. Ages 6 to 18. No reservations required. Sunday, May 13 - 1:00 p.m.
Craig Dobbins is an Alabama-based guitarist, writer, and composer. He has authored many books and recordings about fingerstyle guitar, and has contributed to Acoustic Guitar, Acoustic Guitar Workshop, Fingerstyle Guitar and Just Jazz Guitar magazines. 205 Rivergate Parkway, Nashville, TN 37072. (615) 862-5862. Ages 13 to 19. No reservations required. Free.